Claustrophobia is common during closed MRI scans. "Open" style MRI machines can help alleviate the anxiety. “Open unit” which is a large ring that patients pass through for the exam. “Closed unit” which completely envelopes individuals during a scan. The extended time spent in an enclosed MRI unit often causes claustrophobia during scans. This causes individuals who have never experienced claustrophobia, to sometimes struggle with the closed unit MRIs. Open MRI machines have top and bottom magnetic areas and do not enclose a patient. The space between the two sides often alleviates any claustrophobia. OpenSided MRI uses Hitachi Medical System’s state of the art Open l Machine for their Open MRI scans. Its award winning asymmetrical design produces high quality imaging while providing optimal comfort to their patients. You hear lots of jargon terms in reference to MRI scans, but what does it all mean? FSE: Fast Spin Echo. This is when several 180 RF pulses quickly fill K-Space, which can be combined with half scan techniques for even faster MRI scans. DE-FSE/FIR: Driven Equilibrium FSE – 180 and 90 RF pulse added to the end of FSE echo train to restore longitudinal magnetization, use to increase T2 weighting. FIR: Fast Inversion Recovery – IR pulse follows a FSE sequence. Typically used to create a fat suppressed or CSF suppressed image. primelFSE: Hitachi proprietary FSE technique enables direct TE entry and custom bandwidth adjustments. This is a great way to get a high quality scan with prostheses. Real-IR: Inversion recovery or FIR sequence using “real” reconstruction, opposed to magnitude. 3D-GEIR: Gradient Echo Inversion Recovery – Isotropic 3D T1 imaging. Images can be refurbished in custom planes with high image results. GE: Gradient Echo – Refocuses echos to produce images that are weighted on TR/TE and Flip Angle. SG: Steady State Acquisition Rewound Gradient Echo (SARGE™) – Short TR and rewinder pulses to create a steady state signal with T2* weighting. RSSG: RF-Spoiled SG – Uses variable phase shifted excitation pulse to eliminate magnetization build-up, resulting in T1 weighted images. TRSG: Time Reversed SG – Simultaneous SE and stimulated echo sampling for T2 weighting. BASG: Balanced SARGE – SG sequence with slice, phase, and frequency rewinder pulses. Images are mixed contrast T2/T1. High SNR with bright fluids. PBSG: Phase Balanced SARGE – Balanced SARGE with alternating phase RF excitation to preserve image quality where fatty tissue is present. RADAR™: RADial Acquisition Regime – Radial K-space filling technique providing patient motion compensation and excellent image quality. Applicable to FSE, FIR, DWI, SE, BASG. PERRM: Phase Encode Reordering to Reduce Motion – Respiratory compensation technique. FLUTE™: FLUoro Triggered Examination – MRA technique, watch for bolus arrival with MR Fluoro, fast switch to 3D MRA when bolus arrives at area of interest. TRAQ™: Time Resolved AcQuisition – MRA technique, uses a ultra fast 3D dynamic scan for observation of blood kinetics. VASC™: Veins and Arteries Sans Contrast – Non-contrast MR angiography technique for renal and peripheral MRA. VASC-ASL: VASC Arterial Spin Labeled Non Contrast MRA. Uses inversion pulse to highlight flowing blood. PC-MRA: Phase Contrast MRA – Non contrast technique using gradient pulses to velocity encode flowing blood signal (VENC). PEAKS™: Peak Arterial K Space filling method – Central K-space filling techniques used to optimize arterial visualization. SSP™: Sloped Slab Profile – Varying excitation tip angle technique equalizes saturation of flowing blood for 3D MRA. MTC: Magnetization Transfer Contrast – Additional RF Pulse saturates bound water protein more than free water. Produces increased lesion conspicuity. DS: Dual Slice – Simultaneous excitation of multiple slices. Can be applied to a wide range of pulse sequences for increased anatomical coverage. FatSep™: Fat Separation – Fat and water are separated with phase sensitive acquisition and reconstruction. Provides fat only and water only images. Usable with SE, GE, RSSG, and FSE pulse sequences. RAPID™: Rapid Acquisition through Parallel Imaging Design – Reduces k-space coverage requirements to deliver reduced scan time, increased temporal resolution for dynamic scans, and other clinical benefits. RAPID™ 3D: Enables slice and/or phase acceleration for 3D acquisitions, useful for dynamic imaging. TIGRE™: 3D T1 Gradient Echo with RF fat saturation for Dynamic breast and abdomen. WE: Water Excitation – Binomial pulse alternative to RF fat saturation. Used with 3D GE RSSG for dynamics, BASG for cartilage. NATURAL™: NATural Uniformity Realization Algorithm – Multi-channel RF coil sensitivity normalization. BSI: Blood Sensitive Imaging – T2* weighted images depict micro-bleeds, venous blood. Get a QuoteFill out our form to see how much you can save. Compare CostsSee how much you can save over hospital pricing. 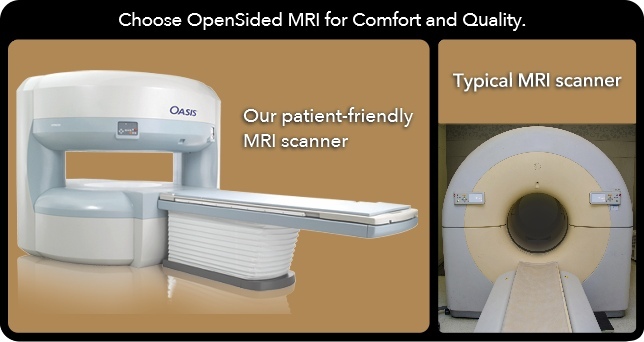 OpenSided MRI prides itself on providing our patients with a comfortable, relaxing environment and fast, accurate results. Fill out our appointment form to schedule your MRI exam. When it comes to your health, it’s important to stay informed. Take a look at some of our FAQs to familiarize yourself with open MRI scans. 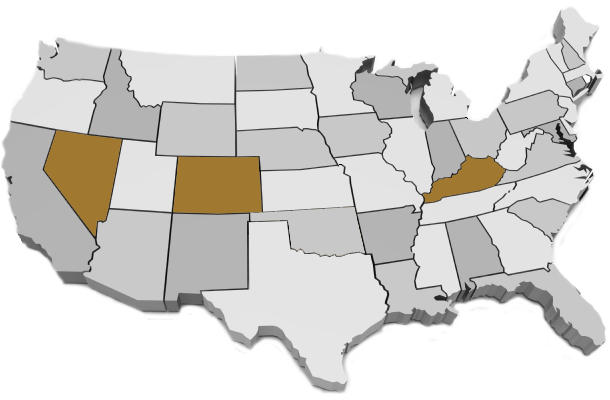 We are conveniently located throughout the country in five locations. We now offer 6 and 12 months interest free* financing with on the spot credit approval. Visit the Care Credit website for more info. 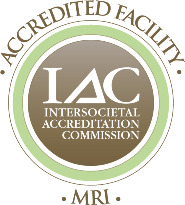 Our mission is to provide high quality imaging and concierge customer service all at a reasonable price.